You are at:Home»Events»Contest»Korean Restaurant Bibigo to host dinner party at London branch! Bibigo is a restaurant that brings Korean cuisine to the wider world. Unsurprisingly, PSY has become the spokesperson of the company since he is probably the most globally recognisable South Korean celebrity right now. The restaurant has actually been holding a competition in which participants vote for who they think is the best chef with the most skills in cooking Korean food. The winning chef will get the chance to work for PSY and voters will be in with the chance of winning a trip to South Korea! 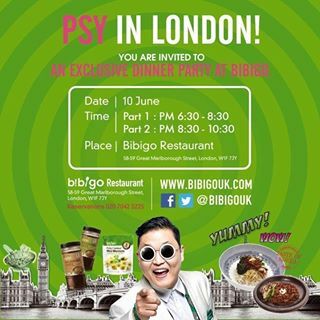 In order to celebrate the closing of the competition and PSY’s return to London, Bibigo is holding a dinner party tonight (10/06/2013) at their London restaurant. Located between Oxford Circus Station and Tottenham Court Road. Be sure to participate in the competition if you can and if you are in the area tonight, go and join in on the party and eat some South Korean food! In related news PSY has performed on the Britian’s got Talent Final and met British singer Robbie Williams whist in the UK. [All credit goes to Bibigo Restaurant]. Next Article [On The Radar] A-PRINCE say hello to A-LAND in the UK!